Andamanese group with Mr Homfray, their keeper, photographed at Calcutta. bl.uk > Online Gallery Home	> Online exhibitions	> Asia, Pacific and Africa Collections	> Andamanese group with Mr Homfray, their keeper, photographed at Calcutta. Portrait of seven Andamanese youths with Jeremiah Nelson Homfray, Superintendent of the Andamanese Orphanage, from the Archaeological Survey of India Collections. This photograph was shown a the Paris Exhibition of 1867. 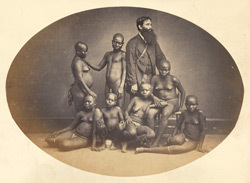 The Andamanese were brought to Calcutta, where they were displayed to the members of the Asiatic Society, before being taken to the studio of Saché and Westfield, where they were photographed ‘in groups, clothed, and in a naked state’ in 1865. The description of this session illustrates how quickly the impact of colonization modified behaviour: ‘At the studio of Messrs. Saché and Westfield, where several gentlemen - strangers to the Andamanese, were present when the photographs were taken, - we encountered positive difficulty, in inducing them to group themselves, stripped of their European clothes. That difficulty overcome, however, it was remarkable to observe how quickly they appreciated the fact that they were required to keep steady, and how willingly they did the best they could, when undergoing an ordeal, which is disagreeable even to those whose vanity it is pleasing’. (Proceedings of the Asiatic Society of Bengal, November 1865, p. 186).